Because there are so many different oils to pick from, choosing the right oil may seem like a daunting task. Oils vary in terms of fat composition, health benefits, and smoke point. Some are better suited for high-heat cooking, while others are best in cold salads, dips, or marinades. Palm oil is the better option in some cases, and while this flavorful oil is high in saturated fat, it may not be bad for you as once thought. Palm oil has pros and cons as it stacks up against other oils in cooking. It's important to note that high-temperature cooking starts at about 375 degrees Fahrenheit (the standard temperature for deep frying), so while it has a superior (a.k.a. higher) smoke point, if you're cooking at a temperature of about 375 degrees, then palm oil doesn't necessarily confer any additional benefits. It really comes down to the flavor you seek. For example, if you are making a tropical flavored cake, then coconut oil probably works better than palm oil. Adding oils raw to foods like salad dressing or as finishing oils is another area to examine with regards to whether palm oil is better. Because of its distinctive flavor (and color), palm oil may be superior to some bland oils like safflower oil when you are making a salad dressing or drizzling it on as a finished product. Depending on the flavor profile you seek, it is comparable to extra-virgin olive oil or walnut oil for this use. For many years, experts advised consuming tropical oils like coconut and palm oil, both which contain saturated fat, could raise blood cholesterol levels and contribute to heart disease. According to a 2015 review published in the World Journal of Cardiology, however, there is little evidence that palm oil has this effect. In fact, the review notes palm oil is not atherogenic (artery clogging), and it may even protect blood vessels from the build-up of plaques that cause heart disease. Authors of this review conclude palm oil doesn't increase blood cholesterol levels, contains heart-healthy monounsaturated and polyunsaturated fats in addition to saturated fat, provides powerful antioxidants vitamins A and E, and protects the heart from artery-clogging plaques. Therefore, as far as heart health goes, palm oil may be superior to corn oil, safflower oil, and certain margarines in how it affects your heart. However, other oils like olive oil, coconut oil, avocado oil, macadamia oil, and butter may be similar to or slightly better choices than palm oil. Balancing omega-3 to omega-6 fatty acids can help reduce the risk of heart disease and decrease inflammation in the body. The standard American diet is very high in inflammation promoting omega-6 fatty acids and low in inflammation fighting omega-3 fatty acids. This is one of the reasons behind the recommendation people take fish oil capsules - to move the ratio of omega-6 to omega-3 fatty acids closer to 2:1 or 1:1, which can help fight inflammation. Therefore, oils high in omega-3 fatty acids are considered helpful in fighting inflammation. 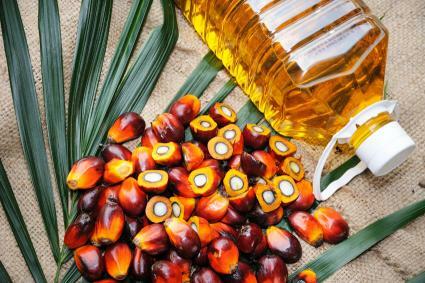 Palm oil is relatively low in omega-3 fatty acids and has a moderate amount of omega-6 fatty acids. Therefore, consuming palm oil contributes to the higher than normal ratio between omega-6 and omega-3 fatty acids. Oils that are better than palm oil because their ratio of omega-6 to omega-3 is closer to 2:1 or 1:1 include fish oil, olive oil, and coconut oil, while oils that have an even higher omega-6 to omega-3 ratio include canola oil, corn oil, peanut oil, safflower oil, and soybean oil. Comparatively, extra virgin olive oil is high in vitamin E, so palm oil has a slight nutritional edge or is comparable to extra-virgin olive oil. Refined vegetable oils like canola oil and safflower oil may have trace amounts of vitamins E and K, although the refining process may remove much of the nutrition. Therefore, refined vegetable oils probably aren't quite as nutritious as palm oil. Palm oil is generally a good choice when you're planning to sear, brown, or deep fry to prevent the oil from smoking. However, palm oil does have a distinct flavor so if you're baking, stir frying, or sautéing, you may want to choose an oil with a milder flavor like olive or canola oil. While palm oil is fairly high in saturated fat, it doesn't appear to increase your risk for heart disease as once thought, according to recent research. Palm oil isn't a good source of heart-healthy omega-3s, but many omega-3-rich oils shouldn't be used for high-heat cooking like palm oil. Likewise, palm oil may have a slight nutritional edge over more refined vegetable oils, and it appears to have less of a negative effect on heart health than oils like corn and safflower. It may also edge out some refined vegetable oils when it comes to promoting inflammation, but it isn't specifically anti-inflammatory or pro-inflammatory. There is a place for palm oil, when used in moderation, for high-heat cooking and food flavoring without increasing your disease risks. Whether it is better than other oils depends on the factors you are analyzing and your unique health and cooking needs.